Correct Wheel Sizes, PCD, Offset, Rims and Tire specs for LADA 2105 series. Thank you for providing such a useful resource. 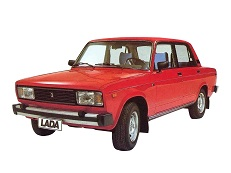 I have one remark on the Lada 2105-2107-Riva (and possibly other models). You indicate the centre bore diameter as 60.5 mm, but othe sites (for example: <http://www.carlsalter.com/lada-wheel-fitments.html> or <http://cararac.com/wheel_sizes/lada/2101-2107.html>) say it is 58.5 mm.